Shirdi Sai Baba Stories,Leelas and Teachings. 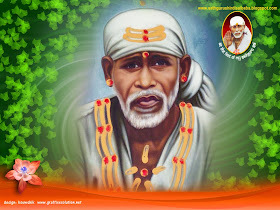 : Divine Dream With Sai Murlidhar-Sai Devotee Sourav Kumar. Divine Dream With Sai Murlidhar-Sai Devotee Sourav Kumar. Wishing Sai children across the globe 'Sai Blessed New Year' .Under the shelter of Sai may all of us tread on the path Lord Sai has showed us .May our thoughts ,actions and deeds be initiated as per His will and be surrendered to His feet . I am sharing two wallpaper designed by R.Kouwshigan ji for the readers.May Lord Sai Jesus bless us all and guide us on right path always. Our Shirdi Sai Baba is the Abode of Mercy ,HE is deeply affectionate towards His children and is always by their side in the time of need. He is present in every atom of this universe be it animate or inanimate.And HE can be seen and witnessed by those who sincerely pray ,desire for HIS darshan and have immense faith on Him.Sai Baba is the only helmsmen in today's time for His bhakta ,by His mere darshan,He does away with fear,problem and pains of human's worldly life .Today's experience shared by Sourav ji reflects the same feeling . Jai Sai Ram . Sairam to all Sai Devotees. First I make obeisance to you. You are the Ocean of Mercy, the God incarnate, the Para Brahma and the great Yogeshwara. I pray you to help me in vanishing the pride and egoism within me and let me to have a touch with Supreme Consciousness of your Blessings. I surrender my egos at your feet. As I know it well also realized unless you take away the egoism residing within me, I can’t be able to write even a single word, then what to describe your Leelas. I used the term SAI KRISHNA at the beginning of my experience which I have never used before today. Rather I used to call SAI, BABA, SAI RAM. It was about from the day I came in contact with Baba and his experiences. I believed him as the LORD OF ALL. With a simple description, we pray GOD in different forms i.e. Lord Ram, Lord Jagannath, Goddess Durga, Goddess Kali etc. There are some persons who describe themselves as devotee of a particular form (example-devotee of Lord Jagannath) and they don’t prefer to worship other forms. This in fact depends on our mentality which determines our lives and we choose to worship those forms where we get inner satisfaction and contentment. This is what I think. A question ‘who Sai Baba actually was’ arose within me and it was me about 16 years old. I needed the particular answer of this question not any description. Was he God or anybody else? It was my soul which was very much anxious to know the answer. Now I realize what kind of fool I was. I same time tried to ask this to others but got afraid of negative result and became silent. However my soul was not silent, it was active in search of those objects which could make itself able to know its answer. Really I know nothing about this attempt. I got my answer towards the end of May 2010 when a great miracle occurred in my life. It is Baba’s grace upon me that I can’t stay without chanting his name even for a minute. When this ‘minute’ will change to ‘second’ I don’t know but I pray him to make this effort continuous till there is life within me. My immediate topic is to describe why I used SAI KRISHNA in the beginning which I’ve never used before today. My request to all Sai devotees not to take this as light one because what happened with me seems preposterous but true. It is our routine to go Shiridi once in 6 months. I will never hesitate to take credit of Baba for our visiting to Shirdi. We can’t have even the touch of grace unless he wishes. Similarly we can’t dream to go to Shiridi unless he calls us. As Baba said, ‘Let my devotee at any distance, a thousand kos away from Me, he will be drawn to Shiridi, like a sparrow, with a thread tied to its feet.’ And this is applicable to all. We have visited Shiridi three times within 30 months of Baba’s contact. Every time I go Samadhi Mandir I see Lord Siva on Baba’s Singhasan in a posture of Meditation. This may be an imagination but gives me immense contentment that my Baba is Lord Siva. I believe it to be a living imagination. Same thing I can see Lord Sri Ram on Baba’s Singhasan. But I don’t like to tell these others except my mother as I think they may laugh at me listening this. One who will laugh at me denotes that either he/she is a non-believer of God (Baba) or he/she doesn’t believe in my words. It’s OK.
My mother is everything for me who only believes my every word instead of investigating its level of truthfulness. I told her about this. She replied Baba is obviously the incarnation of Lord Siva and Lord Sri Ram, same time he wants you to know that all forms of Gods are focused within Him. I got satisfied with the answer. I got the inspiration of doing Vishnu Sahasranam from my father when I was 7-8 years old. The total Vishnu Sahasranam was on my face at the age 9. Also my father advised me to do it in the morning after bath as it would determine the day with a fresh start with Lord’s blessing. From my childhood days the aim of my parents was not only to make me a well qualified person but a firm believer of divine beings to realize the vastness of the supreme power of Almighty, to realize his omnipresence, to realize his supernatural capacity and make me believe in devotional beings and never prefer to get detached from that divine being even when situations left nothing in life. Only those Supernatural blessings can help us in getting out of the hole of misfortune and sadness not anyone else. In those days I used to chant Sri Ram Charit Manash with my father from where I came in contact with Sri Hanuman Chalisa and the whole was on my face at the age 7 or 8. I had a book named ‘Ramayan for Children’ which was provided by my father to me and I used to study it everyday. And I was told by my father to complete it within certain days so that he could buy more books for me. Every evening myself with my father used to pray Gitagobinda. In this way I was made spiritual minded. I can’t remember exactly from whom I for the first time got inspiration of reading Gita. Perhaps it was my father who adviced me to remember the Panchadasha Adhyaya/ 15th chapter (Purushotamma Yoga). I also did it. But the inspiration to make it a habit to read Gita was made by my English teacher (Sri Kishore Chandra Mohanty) whom I believe the 2nd incarnation of God. After my parents if one asks to choose the person I love, respect and believe as the creator of my destiny, then I would answer he is no one except My Guru. He is the source of Energy for me who fills confidence in me and makes me aware about my capacity every time when I lack confidence. He says one thing ‘Believe in yourself.’ Whatever I have become today is due to his blessings. He is my Guru, from whom I learned to transform the whole Gita into my actions. Gita is a guide to life. Every time I fall in confusion or lack confidence or the surroundings make the environment discomfortable to live, I turn to Gita and my problems get solved. Please believe me by this explanations I am not here to make people know how great I am, rather the roots of my experience are such type that it becomes a most important part for me to post these things here, so that the central topic of my experience can be understood easily. As Ì explained above, I could see all forms of God in Baba’s idol except Lord Sri Krishna. Really what a kind of experience this is. I read Gita, but I am unable to see Lord Krishna’s form in Baba’s figure. Here I want to say I have seen almost all forms of Gods (I described above and whom I pray every day) either in dream or in imagination. I tried a lot but no result. But it was neither dream nor imagination where I could see Lord Krishna in Baba. One day in front of Baba’s figure I asked why this kind of differentiation Baba? Are not you Lord Krishna? How is it possible? Please Baba come in my dream and tell me you are Lord Krishna and unless you come in my dream and solve my doubt I will not pray Lord Krishna. It was my foolishness that I discontinued Lord Krishna’s prayer as I had promised before Baba. Though it was a kind of Leela on my part whose roots are at so Deep Ocean of divine blessing that I could not understand it. I made this promise approximately 6 months ago (May 2012). Time passed but same thing I got no reply from Baba. I started forgetting about the promise. One day (perhaps some days after Ganesh Chaturthi) while it was around 04.00AM to 05.00AM I was dreaming. The dream was like this. We (myself and my father) had to go somewhere by train. So we were in hurry as we were already late. I was hungry so my father asked me whether I would eat something or would like to take food after our arrival. I replied, it would be better to eat something before we pick up the train. Then I went to buy some food for both of us. On the way I could see a temple with a wide area around it (campus of the temple). Also there were a large number of Banyan trees which were too old. I forgot about food and went there with a question in mind whose temple was that. Finally I came to know that was Lord Siva’s. There was something a small cage like house in the temple’s campus. I had never before seen this kind of house. With slow steps I started moving towards the cage. I reached at the door of the cage and its height was too small. I could see no God or Goddess there as I had to go further because the actual temple is below the floor/earth. I felt something different. I reached inside the temple and got surprised that there was a small photo of Sai Baba (Dwarkamai). I smiled and looked around. Same time I found there was a photo/ Murthi of Goddess and a mirror (I don’t know who was she and I can’t exactly remember there was a photo or Murthi of Goddess) exactly in front of Baba’s photo. I was then just going to bow I found Lord Ganesh Ji’s figure on the mirror which was exactly in front of Baba’s figure. That was the reflection of Baba’s figure. How we can get a reflection of Lord Sri Ganesh from Sai Baba’s figure? It was only the way Baba reminded me about my promise. What happened next I can’t remember. I told about this dream to my mother and asked her what she thought whether Baba was going to come in my dream in Lord Krishna’s Figure or not? She replied me have patience and watch what happens. Days and months passed. The day came which I was waiting for. 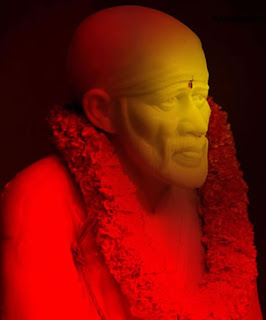 Today (22.11.2012, Thursday), the particular time I don’t know but think during the Bramhamuhurtha (around 04.00AM), the time arrived before me to solve my doubts which I laid before Baba. I was dreaming. The dream was like this. I was on the way to Puri (Jagannath Dham/ The identity of every Oriya). There were 4 to 5 peoples with me. We all were in a car. I was at the front seat side to driver. So that I could see everything clear. After some time I began to say ‘let’s see I can see the temple of Lord Jagannath clearly and also the flag on the temple. You all salute from here; we are just going to reach there within some minutes.’ Lord Jagannath’s temple I think the tallest temple in Orissa. So one can see it easily even from more than 8 to 10 Km. We all were happy and in delightful mood. I was enjoying the natural sceneries outside through the car’s window. The car just passed a temple slowly and I saw Baba was there, sitting on his Singhasana exactly in the same posture as in Samadhi Mandir. I think Madhyana aarati was going on. It was clearly visible and he was Baba. The car had passed approx 100mts from the Mandir campus when an idea entered into my mind and I asked the driver to stop the car. I would go to Baba’s temple. The driver stopped car. I went in the temple and immediately opened the half closed door and entered into the temple with a hope that I would attend the Madhyana aarati. I really love Baba’s Aaratis and when I go to Shirdi I never like to miss even a single aarati. I start forgetting everything even myself while chanting the aaratis. It gives me a divine pleasure which I can’t describe as I am still unable to realize what kind of state is created within me while singing the lines of My Lord’s aarati. Really it is too difficult for me to understand what goes on within my immortal body during that time. A different state gets established in my heart ‘You are the truth of my life’. If by chance I miss aarati, I become mad (Don’t feel comfortable mentally). It’s OK now I opened the door. What I saw then no one will believe. I saw a large black statue of My Lord Krishna and Radha. I became speechless. How would it be possible? While in car I saw the same Singhasan with Sai Baba but when I was inside the temple the same Singhasan was there but instead of Sai Baba there was RadhaKrishna’s statue. How would it be possible? There were a large number of people who were chanting ‘Hare Krishna Hare Krishna Krishna Krishna Hare Hare’ instead of ‘Aarati Sai Baba’. I was silent and looking around, going here and there. I found nothing in which there was Baba (any picture or any statue or anything else) it was like a dream while it was really a Divine Dream. If I would see the same RadhaKrishna’s statute while I was in car, then I would never like to go inside as I’ve promised before Baba. Now I wouldn’t like to describe more about this Divine Dream and like to give the task to the Sai Devotees and all the readers to analyze this. How you will define it? Whether as a combination of happenings or coincidence or Sai’s Leela. Today I asked my mother about the significance of this dream. She was speechless and looking at me. She replied me ‘do you know what today is’? She told me you are the most fortunate boy to have a darshan of Radhakrishna in your dream as today’s day has a different significance. Because today is amla navmi/radha pad darshan(a festival of Radhakrishna/Jaagannath in our Orissa in which millions of pilgrimage come to Puri and pray for their Mukti and Marg Darshan). I think the same is observed in Banaras. Really I also feel myself very fortunate and blessed that in this auspicious day The Lord Himself (My Sai/ My Krishna) came to me leaving his million of devotees who are waiting to have a grace of him for years. Really I am very thankful to Baba. Please forgive me for my guilty. I only wished to see you in Lord Krishna’s figure but I didn’t know you will choose such a way which is yours day same time Lord Krishna’s. Now I need no proof that you are the incarnation of My Lord Krishna-SAI KRISHNA (SAI MURLIDHAR). Sai Baba is, as we know, the living and moving Brahma incarnate. Sai is not finite and limited. He dwells in all living beings. There is no knowing, as to when Baba will accept a devotee. That depends on His will. As Baba said ‘If you spread your palms with devotion before me, I am immediately with you day and night. Also its practical reference is clearly visible in His Leelas with His beloved Devotees. As a devotee is resolute and determined, so is Baba’s immediate response. Sai Baba is always full of mercy. What is wanted on our part is whole hearted devotion on Him. As described in Sai Satcharita His physical or finite form has, no doubt, disappeared from our view, but the infinite or spiritual form ever lives. The leelas, which occurred during his lifetime, are even now happening and it is not limited rather increasing from day to day. 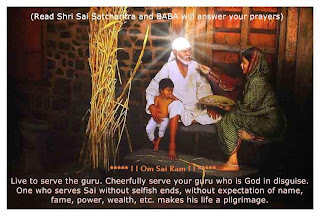 This clearly shows Baba is ever living and helping and fulfilling the dreams of his devotees as before. 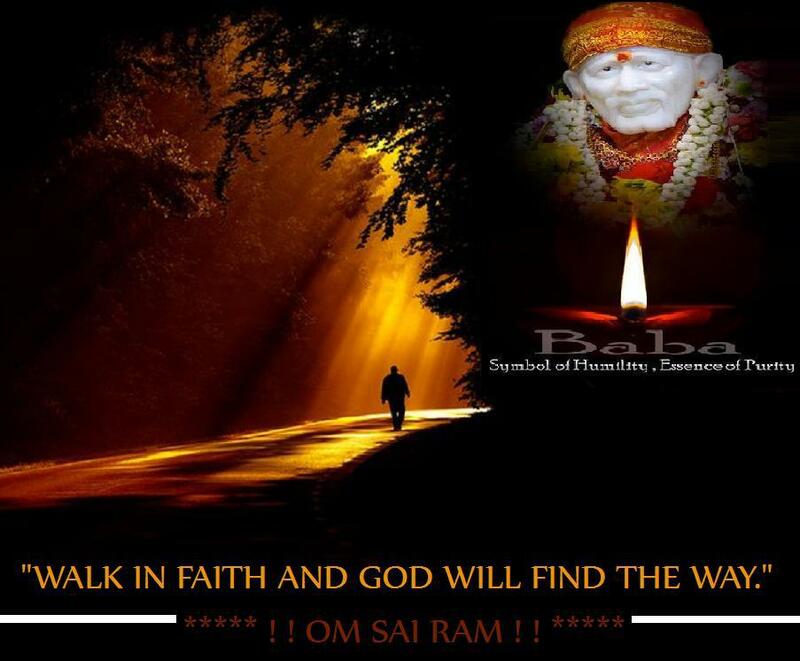 This is our Sai, an incarnation of God. He will bless any man who will prostrate and surrender himself to Him. And who will surrender himself to Him with faith and devotion, will soon be free from all calamities. All his desires will be fulfilled and he will attain Supreme. The above story is not mere a dream but a pure nectar as I believe in terms of Baba’s Leela. He who drinks it will realize the deepness as well as Sai’s greatness and all-pervasiveness. The faithful believers/dedicated devotees or those who considers themselves servants of Sai, will like and appreciate my story. I can’t describe the Leelas of Lord Sai, whose limit is beyond my reach. However I dedicate the whole attempt of putting a part of His Leelas on my part before Sai devotees, which I wish will surely help them increasing their faith on Sai much more times greater than the existed one. Again the entire credit of this attempt goes to my Sai, who on the same day the Leela happened, made me write this, which I think would never be possible otherwise. Oh Sadguguru Sai, we bow to you. We are your servants. Give us rest under the dust of your feet. Oh God’s God we prostrate ourselves before and take refuge in you. The light of you grace removes fear of mundane existence, opens the path of salvation and turns our miseries into happiness. 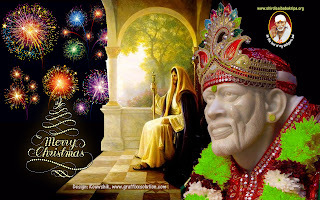 OMM SAI SRI SAI JAY JAY SAI. SRI SACHIDANANDA SAMARTHA SADGURU SAI NATH MAHARAJ KI JAY. 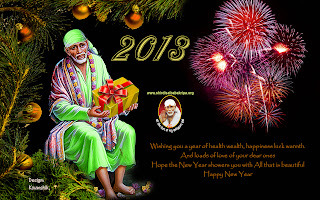 SAI KRISHNA souravji you are really a true Baba devotee as Baba has cleared all your doubts.I feel Baba made you share this wonderful experience so that all sai devotees could read and feel the bliss on new year.This is also our Baba's leela and a new year gift to all sai devotees.